Visual-Planning is a software that is part of the family of management applications. This management and operations tool allows managers to plan, manage and optimize all the resources associated with the production or management process of an organization. In addition, this software has the ability to perfectly align with the organization's information system. This avoids a multiplication of redundant data. And, thanks to its analysis functions, this tool would be able to prevent or diagnose any problem related to production: hence the participation in the creation of more value for the company. If we assume that value creation in a company is the result of mobilizing resources and then coordinating them, we could conclude that Visual-planning is the planning tool par excellence and a decision-making aid. 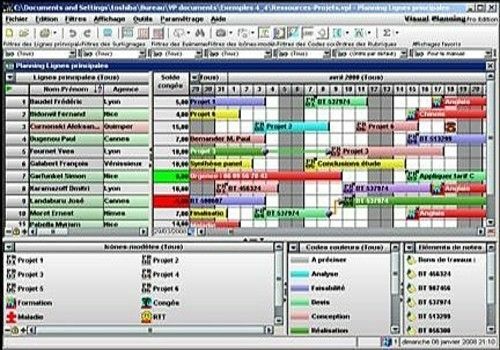 Indeed, in order to optimize productivity, the software also takes into account certain specific constraints (deadline, quantity, quality, cost,...) of each of the resources mobilized and combines powerful functions with operational planning for the analysis and reporting of data from the information system. Regardless of their location, the software allows each stakeholder to access planning data in order to mobilize or update them. The consideration of mobility is one of the parameters that distinguish this management software from other solutions available on the market. The program has the capacity to receive on a regular and unconditional basis the data or information provided periodically by all stakeholders who have access to the system. It saves time, integrates management rules and business specificities. It is an intuitive and quick to learn tool. Very simple and practical: to try for free with all its features.